Authorities say a Boone man, who was shot by police officers Sunday night, was carrying an air pistol. Twenty-seven-year-old Seth Miller died on Monday. Three police officers were involved in the shooting which occurred outside a bar in Boone called the Eastside Hideaway Lounge. D.C.I. agent Michael Motsinger says all three officers fired their weapons at Miller when he refused to drop what appeared to be a handgun. "The officers encountered (Miller) in the alleyway and requested he drop his handgun on several occasions," Motsinger told Radio Iowa. "The suspect did not do that and the officers had to respond with force." The officers said Miller raised his weapon in their direction before they fired. A total of four rounds were fired, with at least one hitting Miller. Motsinger says the air pistol looks very much like real gun. 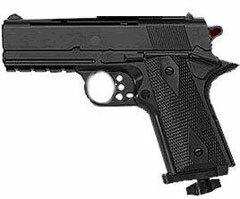 "It is a black, handgun style Powerline Model 15XT air pistol and there are no markings that identify it as an air pistol, so the officers have to assume that it’s an actual handgun," Motsinger said. The incident occurred shortly after 10:45 p.m., which also limited the officers’ ability to see what Miller was holding. Motsinger says there are no streetlights in the alleyway and the officers only had flashlights to aid with visibility. Boone Police Captain John Sloter, Officer Dave Powers and Boone County Sheriff’s Deputy Cole Hoffman have all been placed on paid administrative leave. A relative of Miller’s says he had recently been diagnosed with borderline schizophrenia and sometimes failed to take his medication. Miller was the father of two children.